A priest has been awarded South Carolina’s highest civilian honor. 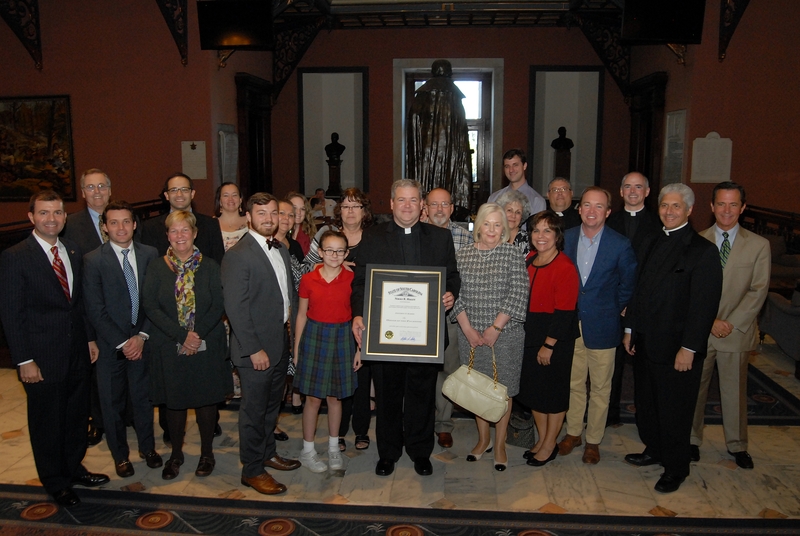 Recently, Father Jeffrey Kirby of the Diocese of Charleston, South Carolina, received the Order of the Palmetto from Governor Nikki Haley. The award was given in recognition of Kirby’s “extraordinary work and dedication to the citizens” of South Carolina. The priest’s work was the result of his ministry as the diocesan Vicar of Vocations from 2010-2015. In that period, he drove extensively throughout South Carolina ministering to local parishes and communities, high schools, elementary schools, youth groups, college campus ministries, young adult groups, homeschooling associations, and to Catholic families. In this outreach, Kirby’s car amassed over 450,000 miles. In these travels, Kirby organized programs, groups, and other opportunities for growth in virtue and development in leadership. These efforts had the secondary effect of providing strong leaders of character in the public forum outside of Catholic entities. The senator’s comments reflect the historical minority status of the Catholic Church in South Carolina, which currently numbers about 75,000 households. This is about 4% of the state population. Although a minority in the state, the Catholic diocese spans over 120 parishes and missions, 30 schools, 3 hospitals, and a developed network of social outreach centers and services. After concluding his work in vocations in 2015, Kirby was sent to Rome to complete his doctorate in moral theology at the Holy Cross University. While preparing for his thesis defense, Kirby worked with St. Benedict’s Press in producing the national parish-based adult formation program The Doors of Mercy. The program sought to help local communities participate in the Extraordinary Jubilee. In leaving Rome himself and returning home to South Carolina, Kirby was surprised in being selected for the Order of the Palmetto. The award is a reflection of the priest’s service to the Gospel message of mercy, virtue, conversion, and leadership in the world today.